The beautiful hilltop village of Monteriggioni embodies many of the elements that made Tuscany a favourite refuge for travellers. 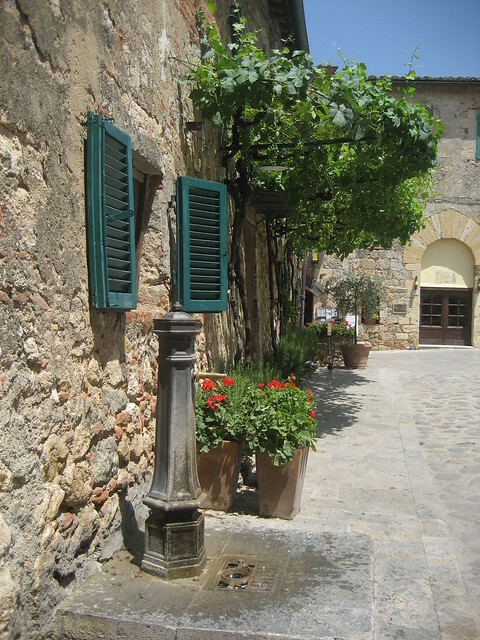 Here is all you need to know to plan a day trip to Monteriggioni from Florence. Florence is the perfect base to visit Tuscany and if you have time to explore, I highly recommend to make some time for the lovely medieval town of Monteriggioni. 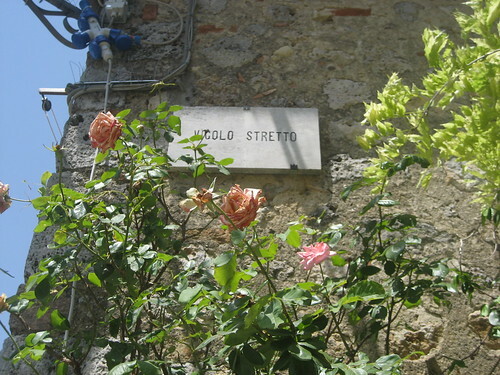 we visited a few years ago, on the way to the Tuscan coast, and had a lovely lunch in this small Tuscan jewel. Monteriggioni will only require an hour or so to visit but will reward you with amazing views, interesting history and great food. here is how we got on. Located in the province of Siena, just about 60 km, south of Florence, Monteriggioni is the quintessential Tuscan village and one of those places that embodies the very reason people love to visit this part of the world. It is pretty much everything you think of when you think of Tuscany: hilltop position, olive trees, ancient churches, craft shops and of course amazing Tuscan food! Monteriggioni is a hilltop village dating back to 1200 a.D. It was originally built by the Senesi (inhabitants of Siena) as a military garrison against Florence and this military origin is still evident in what is probably the most incredible of its traits: the village is entirely surrounded by tall walls most of them still intact. You first spot Monteriggioni when leaving the autostrada. As soon as you get the Strada Provinciale, you see it sitting on top of the hill, overlooking the surrounding flatter land from the safety of its tall walls, their colour making them a flawless continuation to the dry land. The sight of Monteriggioni from afar is incredible and shook the kids from their road-trip daze: in a matter of seconds, we got them interested in knights and medieval times, something up to that point they had only encountered on TV! 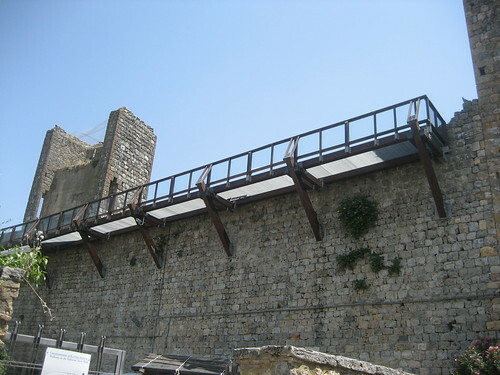 To reach the top of the hill, you must drive along a well-paved winding road, which brings you to a big parking space just outside the city walls. The higher you climb, the more you can see above the many olive trees dotting the hill, out to the wide countryside around you: the drive up doesn’t take more than a few minutes and the sight is truly relaxing. 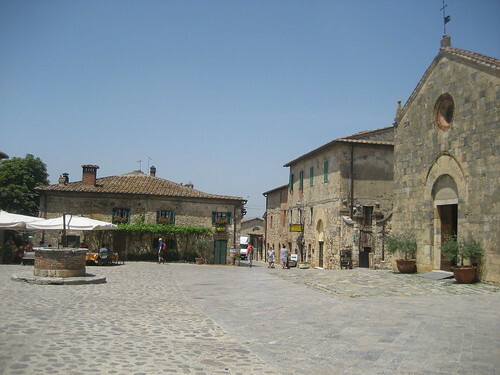 If you prefer not to drive, there are several tours that bring you to Monteriggioni and combine a stop here with others in equally beautiful locations such as San Gimignano. This leads you to the main (and only) square with a beautiful Romanesque church, an old well and a selection of shops and restaurants with craft displays and inviting tables. The city is far from being unknown to tourism, but we were pleasantly surprised by it: despite the many shops and restaurants the food was good, the service kind and the number of visitors not that high: the whole town was immersed in a sleepy and very pleasant atmosphere that made it perfect for a day trip outside the busy streets of Florence. We were there in the late morning, mid-week, and if you can pick any day to visit Monteriggioni, I would recommend you do the same: Monteriggioni is on many tourist trails and I can imagine it getting easily overwhelmed by big crowds and buses. If you have time, the best option would probably be to stay the night: near the main square there is a gorgeous hotel and, once all the tourists are gone and the shops are closed, you would be guaranteed dinner in a truly special setting. You can visit the whole of Monteriggioni in a matter of minutes and if you are not afraid of heights (and you don’t have small children with you) you can also climb up to the top of the walls to have a panoramic walk around the city. We did not dare go and, instead, we took a stroll around the beautiful streets and took our time at the craft shops. 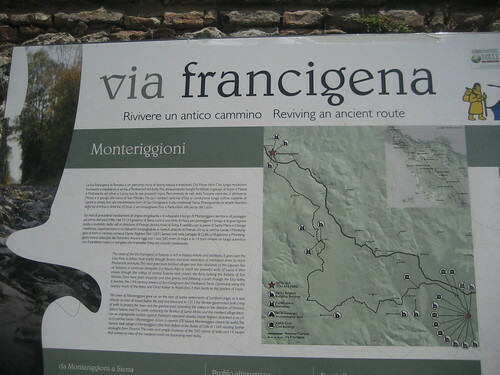 We also got interested in the history of the city and of the Via Francigena, the ancient pilgrim road connecting Rome to the North of Europe and which passed through Monteriggioni. 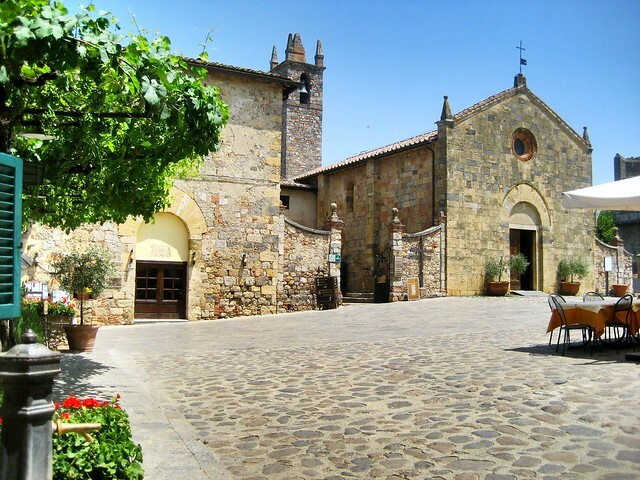 Because of its hilltop position and medieval structure, Monteriggioni gets very hot in the summer and offers little shade outside the restaurant terraced patios. We got there on a very hot day (38 degrees Celsius, it takes some getting used to…) so we were happy to discover a fountain of cool drinking water just at the far side of the piazza: the kids spent quite some time splashing around and loved every second of it. 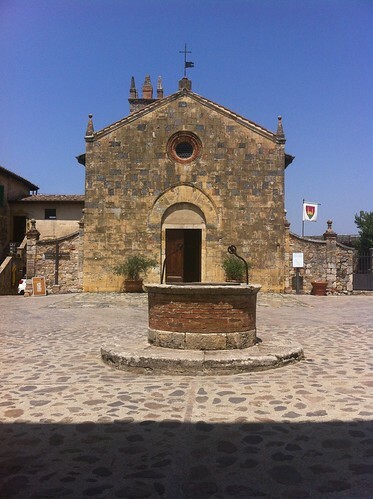 The little fountain with drinking water in the main square of Monteriggioni: a lifsaver if visiting the village in the summer! The menu had typical Tuscan specialities (cured meat, cheese etc), refreshing cold beer and a good selection of child-friendly dishes like pasta and caprese salad. The meal finished with a lovely home made gelato: history loving parents and gelato-loving kids all very happy. If you are hoping to go shopping, try avoid lunchtime as some craft shops close for up to two hours during the hottest part of the day (12.30 to 2.30 pm, exact times depending on the shop). Local crafts include leather goods (their bags are gorgeous!) 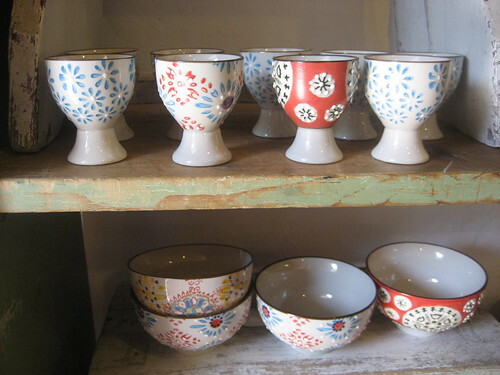 and pottery. 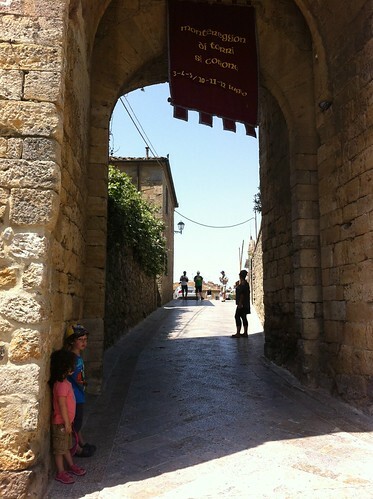 There is nothing strictly ‘for kids’, but we found that the flags, the map of the via Francigena and il gelato from the gelateria on the main square made for a great day out for the little ones too, so Monteriggioni is a stop I would highly recommend!